The individual tasks of freight processing vary from one retailer to another. The size of the delivery, the type of products, location for receiving, and method of tagging each play a vital part in merchandise handling. However, the overall concept of receiving merchandise is very similar for most retail stores. Whether an order is placed weekly with a home office distribution center, seasonally at buying events, or randomly with individual vendors, the store manager or owner will most likely be informed of the intended shipping date and can prepare for receipt of the merchandise. Stockrooms and storage areas should always be clean and well organized to allow for easy access to merchandise. 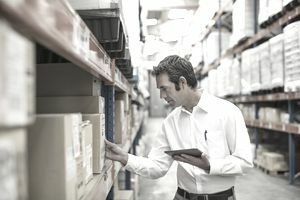 A few days before the scheduled receiving date, spend time rotating overstock and moving back stock to the sales floor. Create bulk displays and add additional shelving, if necessary, to reduce the amount of freight in the back room. Remember, it cannot sell if the customer cannot see it. Retail chain stores often schedule weekly deliveries of ordered inventory to arrive at each store on a predetermined day of the week. Knowing when the merchandise will arrive can aid in scheduling extra staff. Some retail stores hire personnel specifically for merchandise handling and stocking; others distribute this work among sales staff. Be sure to have adequate coverage on the sales floor, as well as receiving. Shoplifters may be waiting for your weekly truck to arrive because they know the employees are busy checking in freight and not watching the store. When the products arrive, they may be in plastic containers, cardboard cartons, wooden crates, or other packaging. Some merchandise may be on hangers while others are on pallets. Keep in mind that a receiving area is designed to receive, not warehouse, merchandise. Each step of processing freight should be done quickly and efficiently. Confirming the number of cartons match the quantity on the bill of lading. Examining the containers for signs of damage, including leaks, tears or broken seals. If necessary, verify that the weight matches the amount charged. Any discrepancies should be noted on the freight bill before signing. The retailer is responsible for the entire shipment, as-is, once the receipt for goods is signed. Large shipments should be sorted as the cartons are unloaded. Having similar merchandise grouped together will make the remaining processes of receiving merchandise much easier. Once the shipment has been accepted, the next step of processing freight is checking in the merchandise. Some vendors may mail an invoice separately from the shipment. A packing list is often included with the goods. The two documents may look similar, but wholesale product prices and shipping costs are generally excluded from packing lists. Many retailers opt to continue the checking-in process only after the invoice has arrived. Prices and additional terms of sale are as agreed upon. Quantities received by the retailer match purchase order. Product styles, colors, sizes received are identical to purchase order. Merchandise quality equals, or exceeds, the buyer's expectations. Problems and discrepancies should be documented and reported to the proper party responsible. Cartons missing or damaged in transit become the responsibility of the freight carrier or the transport company. Vendors and manufacturers should be notified if the order is of poor quality, incorrect quantities, missing, or contains the wrong merchandise. Be sure to obtain a resolution to any problems before continuing to the next process of receiving freight. A crucial step in merchandise handling is pricing merchandise. The method will vary with each retailer. Some small shops may still place price labels directly on the product. Others use shelf labels as a means of communicating prices. Many retailers use barcodes and electronic point of sale to maintain inventory pricing. Whichever pricing method is used, it is very important to make sure merchandise is priced before it leaves the receiving area. It can be extremely frustrating to a customer wanting to purchase an item that cannot be scanned or does not include any indication of a price. Do not cover any important information on the product packaging. Most tags and labels should be placed on the upper right area of the product. Color-code labels for special events or markdowns. As soon as the inventory has been received, checked-in, and priced, it should immediately make its way to the appropriate location within the store. Chain stores and larger retail environments may use plan-o-grams or allocated shelf space for the new arrivals. Smaller stores may have specified departments or zones. Regardless of size, each retail store should have some designated selling space for each particular product line or category of merchandise. New merchandise may have an initial distribution dilemma. Buyers, merchandisers and/or store managers can coordinate to determine the best location for new arrivals. Not all freight will be available for display immediately after arrival. Some merchandise may be held temporarily if it is considered seasonal or for a planned promotion. Don't forget about these products. When the correct time arrives, move the merchandise to the sales floor as soon as possible. Plan each process well to reduce the amount of physical contact with the products. Keep aisles and emergency exits free of stock. Work high-priority and fast selling items first. Price labels and tagging supplies should not be left in areas accessible to customers. Avoid injury by working safely and efficiently to prevent accidents. The final stage of the freight process should be an attractive and well-planned display of exciting, new merchandise presented to the customer. Keep in mind, this last stop for the merchandise is the first thing the customer sees.